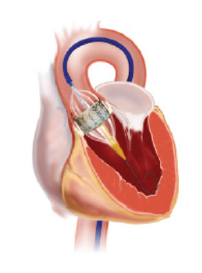 What is a transcatheter aortic valve replacement (TAVI)? 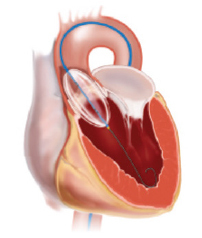 Typically conducted under local anaesthesia, transcatheter aortic valve implantation (TAVI) is a minimally invasive procedure whereby a new valve is inserted without removing the old, damaged valve. 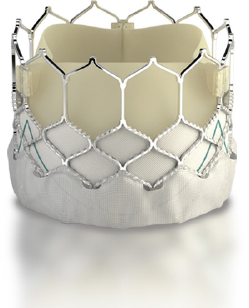 The TAVI approach delivers a fully expandable replacement valve to the valve site through a catheter. Once the new valve is expanded, it pushes the old valve leaflets out of the way and the tissue in the replacement valve takes over the job of regulating blood flow. Compared to surgical replacement it is less invasive, is generally performed under local anaesthesia and does not require cardiopulmonary bypass. Furthermore, TAVI results in a shorter hospital stay and a faster recovery. Some patients unsuitable for surgery may now be treated using TAVI. In addition, the incidence of death or stroke is 1-2 percent which is lower than conventional surgery. To see more about Transcatheter Aortic Valve Implantation (TAVI) refer to the documentary featured on TV 3's Close Up programme. There is a small risk of death or stroke. Haematoma at or bleeding from a puncture site may occur. Abnormal beating of the heart may need a pacemaker (risk is 5-25% depending of valve type). Allergy to the contrast (Xray dye) is rare. The contrast (dye) may damage kidneys that are already impaired. How is the TAVI procedure performed? TAVI is conducted in an angiography suite at Intra. Your interventional cardiologist will be assisted by nurses and other highly trained personnel. 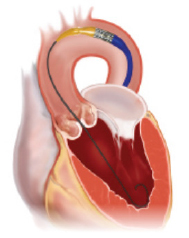 Access is gained via the femoral (groin) artery or the transapical approach and the delivery catheter with the aortic valve prosthesis is advanced to the narrowed valve. 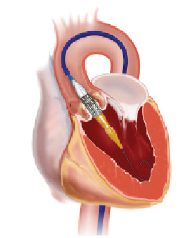 The new valve, loaded in a specialised delivery catheter, is advanced to the stenosed aortic valve through a small hole in the femoral artery in the groin. Once correctly positioned, the balloon is expanded, deploying the valve. The delivery catheter is then retrieved and the groin puncture site closed. Leaflets made from cow pericardium (the strong but thin membrane that surrounds a cowâ€™s heart). Deployed by expanding a balloon. A "skirt" limits leakage around valve. How should I prepare for the TAVI procedure? Medication: Please inform your cardiologist and anaesthetist about all the medication you are taking. You may be advised to stop taking some medication temporarily for a few days before your procedure e.g. blood thinners. Allergies or previous reactions to contrast (x-ray dye): Please inform Intra staff at the time of booking your procedure if you have any known history of allergies, particularly allergies to x-ray contrast. Diabetes: If you are a diabetic you should inform your cardiologist and Intra staff at the time of booking your procedure. You may need to discuss your insulin dose with your anaesthetist and cardiologist. On the day of your admission you will be admitted to the Mercy hospital ward and later transferred to Intra for your procedure. Is TAVI reimbursed by health insurance providers? The majority of health insurance providers now offer reimbursement for TAVI. This must be approved by the insurance provider based on their eligibility criteria. In order to be considered for a TAVI procedure, you would need a referral from a cardiologist that it could be suitable for you. Please contact our friendly team at Intra and we can help you through this process, regardless of the stage you're at. What are the Southern Cross criteria for TAVI reimbursement? 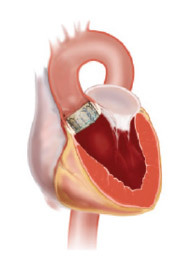 Southern Cross will reimburse the cost of a Transcatheter Aortic Valve Implantation under a member’s policy when all the following criteria are met as reviewed and agreed by the Heart Team. 4. The patient is technically suitable for TAVI.